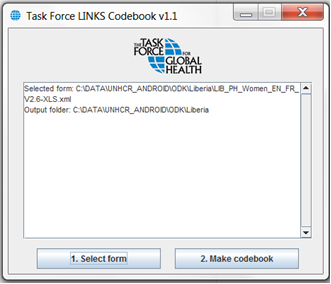 It is now almost two years ago when Nafundi announced the release of the free code source book called Task Force LINKS Codebook on their blog. (http://nafundi.com/blog/posts/nafundi-and-task-force-release-codebook-generator-for-odk/ ). The tool is extracting questions, answer choices and their coding values out of xml forms coded for use in ODK. At the time, I read the blog post with interest, downloaded the tool, tested it, found it to be working well and then forgot about it again. Well, not immediately, I did use it on the survey we were supporting at the time and whilst the partners did have a look and also thought it was useful, nothing further happened. They did not actively use it and also we did not. I remember sharing my experience with colleagues but also they did not see any further use case at the time. Now, two years ago, we had not been using xls forms. The calculations we needed had not been supported back then in xls syntax. Now we mostly use xls forms, and of course there it is easy to extract the questions as opposed to extort it of the xml. But even so, getting a quick overview on the questions, their answers choices and how those are coded is also not so straight forward for the novice or non-technical ODK user when looking at the xls form in Excel having to consult several tabs. So I remembered the Code book and decided to use it. It is then extremely simple: you just double-click on the jar file click on “1. Select form”; and do just exactly as you are bid; i.e. select your xml in the upcoming browser window, then click on “2. Make Codebook”. It will create a codebook in pdf format for every language included in your xml. The pdf is automatically created in the directory where your xml is stored. The pdf contains three columns: Variable name, Question text and Saved Value, the latter listing the choices and their respective coding values. One gains immediately a quick overview on the questions and controls used presented in a reader-friendly fashion and which can be easily shared for consultation or refining a questionnaire based on a similar thematic. I was amazed myself again how fast and effective this tool works.